Craig Olson, a candidate for the 2nd District Congressional seat, addresses the Democratic Convention, Friday, May 18, 2018, in Lewiston, Maine. 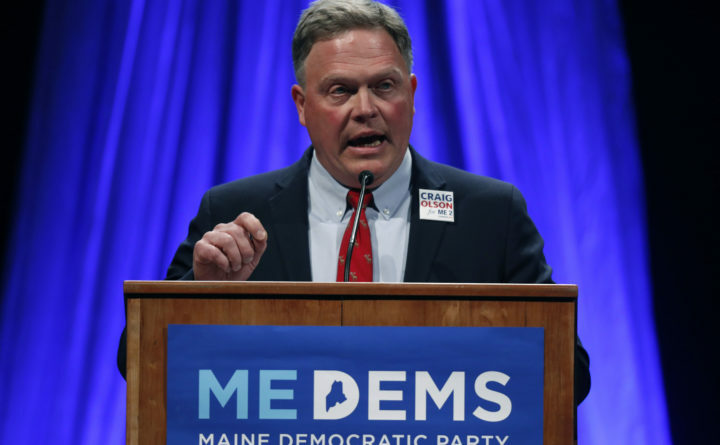 With the June 12 primary approaching, Maine’s 2nd Congressional District voters have a dwindling number of possibilities to consider for their next congressman. For Republicans, incumbent Bruce Poliquin will be the party’s candidate in November. Running for a third term in Washington, Rep. Poliquin has distinguished himself in supporting President Donald Trump, voting in line with Trump over 95 percent of the time, including for a repeal of the Affordable Care Act and the recent tax cuts. If you’re a Republican, you probably need to read no further, but stay with me for a bit. The Democrat candidates come from diverse backgrounds. Jared Golden touts his military service and state legislative leadership. Lucas St. Clair points to his work on the Maine Katahdin Woods and Waters National Monument, born of his mother’s investment in Maine woodlands and fraught with controversy. Craig Olson has no such resume and would seem to be the underdog in the race. Who do you want representing you in Congress? Taken another way, what kind of person, in terms of character, life experience and values, do you want for our next congressman? Given the names and resumes, let’s step back a bit and look at what these candidates represent. Poliquin stands as the conservative who grew up in Maine, but left the state to become a wealthy investment banker. While supported by a number of out-of-state PACs including a Republican Super PAC, he has been increasingly disconnected from the average 2nd District constituent. How does he expect Mainers to trust him when he won’t even meet with them and appears to favor the wealthy? Golden has built an impressive resume in his young life. He loves to recount his story of how the low ranking Marines are always the first to eat in the mess hall and revels in his role in the Maine House, both as examples of his concept of leadership. But what has he learned from the wars in Afghanistan and Iraq — so costly to America in blood and treasure — and from a Legislature that, at this writing, has left Maine schools unfunded for next year and a host of other measures on the table with no plan to reconcile the political differences that placed them there? Without question, St. Clair has worked tirelessly to transform Maine forest into a national monument and since announcing his candidacy, equally as hard to remind voters he’s from Maine. Beyond his mother’s wealth and notoriety, what does he offer the average Maine voter? Olson’s resume, as mentioned, reflects none of the superlatives of the others. So how does he measure up? Olson and his wife Melissa decided to bring their young family to Maine over 16 years ago to raise their three daughters in a beautiful and nurturing environment. They have fallen in love with the Maine coastline and more importantly, have become part of the fabric of their community in Islesboro. While operating an independent used and rare book business, Olson has served on the Islesboro Planning Board, board of selectman, school building fundraising committee and as moderator for town meetings. When the Isleboro Transfer Station needed management, Olson took on the responsibility in addition to his own business. Like many Mainers, Olson has found a multitude of ways to contribute to his community. When you talk to him, you find that like many Mainers, Olson understands the issues we face on a daily basis. A diagnosis of cancer and treatment needed to recover from it, a blown furnace and his wife’s costly eye treatment forced Olson to struggle through a difficult time and appreciate the support of his community. He understands the obstacles presented by our healthcare system, the difficulties a small business owner faces and the need to work within a community of diverse opinions to solve problems for the benefit of all. So, who do I want representing me in Congress? Someone who understands the struggles the average Mainer faces on a day-to-day basis and someone who will rise above the toxic political discourse in our country to work collaboratively for solutions that benefit all Mainers and Americans. My vote is for Olson for the 2nd District of Maine. Charlie Maddaus is a member of the RSU 10 School Board and a retired banker and high school teacher. He lives in Sumner.